A new exhibition featuring cars from National Geographic’s popular motoring TV show Car S.O.S. Car S.O.S. 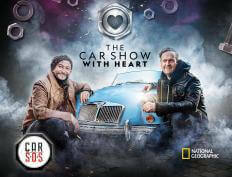 is a popular motoring TV show that airs on National Geographic is now in its 6th series. The show’s presenters Fuzz Townshend and Tim Shaw have brought sixty cars back from rusty wrecks to their former glory; everything from family classics to hot hatches and elegant sports cars. The exhibition will feature seven cars that have been rebuilt by the Car S.O.S. team including three still shining from restoration in the most recent series. On display will be a pre-war Austin ‘Tilly’ truck which underwent a sympathetic overhaul, a vibrant yellow Lancia Delta Integrale with a touching back story and a rare AC Aceca sports car along with four others – an MGA, Volvo P1800, Aston Martin DB6 and a Ford Capri RS3100. Graphics and clips from the relevant episodes will run alongside each of the cars – detailing the many technical dilemmas Tim and Fuzz had to get the cars back to their best. They will also give an insight into some of the personal stories and challenges faced by each of the cars’ owners. The Car S.O.S. exhibition will open on the 26 May 2018 on the Museum’s Mezzanine and run until February 2019. The exhibition is included within your Museum entrance fee.